Seems like every social app is slowly shifting towards eCommerce these days. 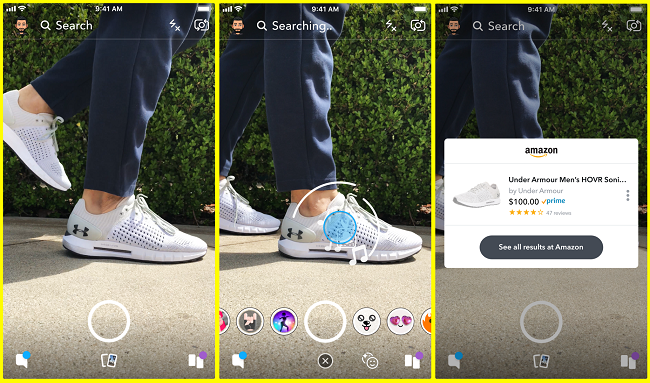 Hot on the heels of Instagram expanding its shopping tags in Stories and adding a dedicated shopping feed in Explore, Snapchat has this week announced a new partnership with Amazon which will enable users to shop at any time via the Snapchat camera. Yes, the option is very similar to Pinterest's Lens tool, which enables users to scan in objects and find related visual matches on the platform. But Snapchat's variation doesn't utilize an in-built product catalog like Pinterest's Lens - instead, it refers to Amazon's product library, and prompts you to open the Amazon app to make an immediate purchase. This seems like a good move in many ways, considering that Amazon is already the established, and trusted, leader in eCommerce, and has more than 560 million products listed. If Snap's visual identification tools work reasonably well, and link users through to relevant products to buy, it could prove to be a big win. Definitely, if Pinterest is the comparison, there's clear potential there. Back in February, Pinterest reported that its users are now conducting more than 600 million visual searches per month, and that mobile visual searches are up more than 60%, year-over-year. More than that, Pinterest is also growing at a faster rate than both Twitter and Snapchat. That growth can’t be solely attributed to Lens use, but it is a part of the app’s broader expansion and rising use case. And wouldn't Snapchat would love to tap into that? The platform, now under increased pressure from shareholders, actually reported a decline in daily active users in its last performance report. Given the younger user base of Snap, as opposed to the shopping-focused audience on Pinterest, it's difficult to predict what potential this integration could have. But it certainly can't hurt - and it could also help Snapchat strengthen its bonds with Amazon, which has been trying to build its own social app to compete with the likes of Facebook and Pinterest. Maybe, they could each provide key elements for each other in this regard. The announcement itself isn't really a surprise. Back in July, TechCrunch reported that Snapchat was working on new visual product search features, based on insights gleaned from the back-end code of the app. It actually looks pretty smooth too - check out this video of the functionality in action from TechCrunch's Josh Constine. As much as there's always some hesitancy around new advertising or promotional tools on Snapchat, given the initial 'anti-commercialism' approach of the app, its difficult to fault this one, particularly because its non-intrusive. If you're not interested, don't use it - though I'd be willing to bet a lot of users will be. As noted by Snapchat, they're rolling the functionality out slowly, so if you don't see it yet, you will soon. The true test, of course, will come down to just how good the product matches provided are. But there's definitely a lot of potential here - and a lot of expanded opportunity, based on the system, to build-in new promotional and ad options, dependent on take-up. Also, in a potentially related update, our favorite code hacker Jane Manchun Wong has noted that Snapchat is also testing out a new 'rating sticker', with an option to give an image a rating out of five. Could that also provide a way to rate products on the platform, underlining its eCommerce efforts?